The list has been updated on September 26, 2009. A big mahalo to Mary Jane for sharing the following story with us. 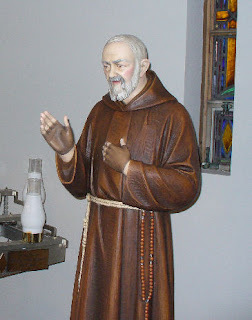 If you remember I recently shared about becoming a spiritual child of St. Padre Pio here. 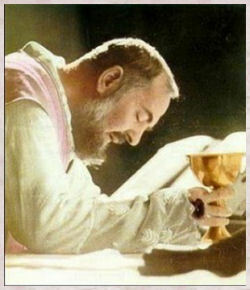 Padre Pio, during his lifetime, accepted many people as his spiritual children. When assured of their goodwill, he always told them: "I accept you, but don't make me lose face." Today many of his devotees still want to become his spiritual children. What are they to do? Application should be made in writing. 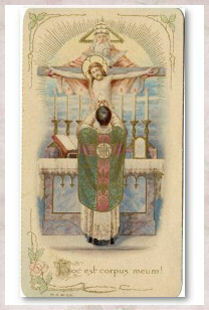 A Mass is offered daily for all enrolled, both living and dead. The usual offering is $6. Enrollment may be made individually or by family. Please visit St. Monica's Kneeler for more information. may they find the courage and perseverance to balance work, family, and faith in joy and sacrifice. may they continue to lead in strong and gentle ways. may they know that the God of compassion walks with them in their sorrow. but who live forever in our memory and nourish us with their Love. "The Story of Saint Damien of Molokai, Sacred Hearts Priest" will also be shown on primetime Sunday, October 11, 8-9pm on KALO-TV38 (Oceanic Cable Chan. 25). Sunday, October 11, 1pm, " " " "
The special screening was held at beautiful St. Ann's Church in Kaneohe this morning. 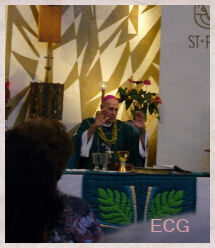 The documentary began with a message from Bishop Larry Silva of the Diocese of Honolulu. It then proceeded to give a brief history of the founding of The Congregation of the Sacred Hearts of Jesus and Mary (SSCC). Amazingly, it was founded in Poitiers in France, in 1800, by Henriette Aymer de la Chevalerie and Pierre Coudrin during the time of the French Revolution! It was to this particular order that Joseph de Veuster, of Belgium was drawn to and eventually joined. Then there was a little coverage about Father Damien's family background back in Belgium. He came from a very devout Catholic family of farmers. He had a brother and two sisters who became Ursuline nuns. His brother as most everyone knows was a priest. 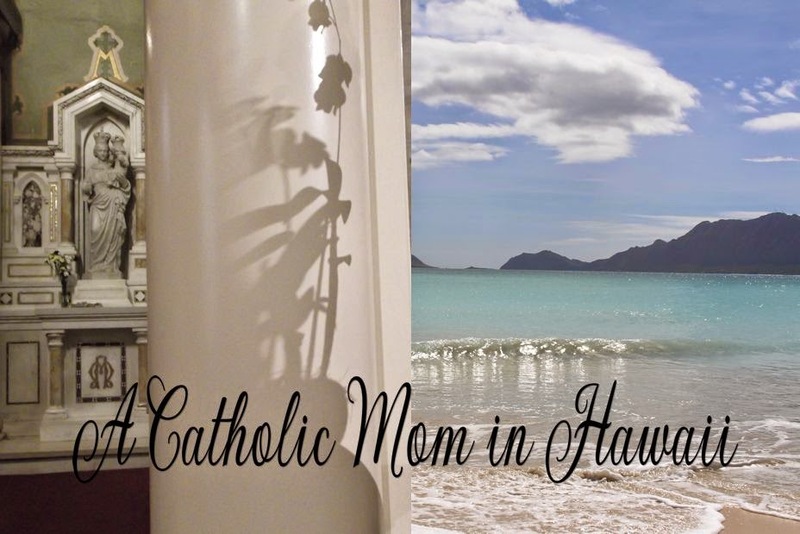 The documentary continued with a little history of the Catholic Church in Hawaii. It was really good that this history was included because even though Catholics are presently in the majority in Hawaii, at one time Hawaii was anti-Catholic. It really is impressive that the persistence of the first missionaries from France, were able to establish parishes. Yet with God's help and guidance, that is exactly what they did. 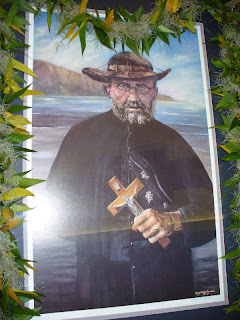 It was to these Hawaiian Islands that Father Damien came as a seminarian. He was ordained a priest at the Cathedral of Our Lady of Peace. His first assignment was on the Big Island in Puna. 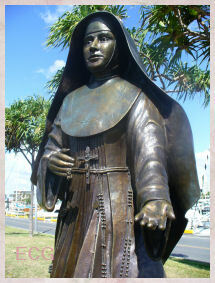 The Bishop at the time, Maigret, needed to send a priest to the leper colony on the island of Molokai. 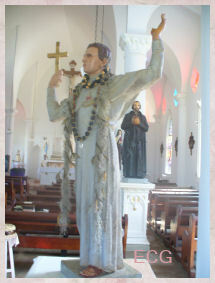 Four priests volunteered and Father Damien was the first to go. He was supposed to go for a few months and then another priest would replace him. As you all may know, that did not happened. The documentary makes it quite clear the love that Father Damien had for the Hawaiians, especially those on Kalawao on Molokai. They loved him too. This documentary also makes it clear that not everyone liked Father Damien. What I liked about this particular documentary is that it tried to stay true to the whole story of Father Damien. He was a real man with real feelings and emotions; he was a real priest, not one wearing a halo and he was a real saint in that he gave his life for his friends. The documentary also shows the interview with Audrey Toguichi and her doctor. 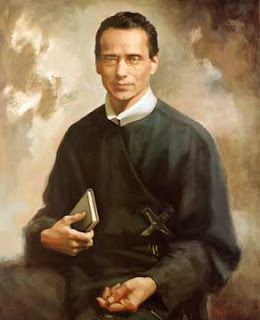 It is because of divine providence as Bishop Silva pointed out, that a woman from Hawaii's cure is what has made the upcoming canonization of beloved Kamiano, possible. After the documentary, we were fortunate to have Father Herman Gomes, SSCC, an expert on the life of Father Damien, have a question and answer session. I learned from Fr. 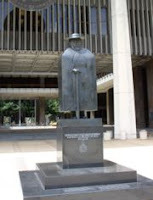 Gomes that even though Father Damien was a poor student, he was able to speak five languages: Flemish, French, Ecclesiastical Latin, English and conversational Hawaiian. So a big mahalo to Venny for the invitation and to Fr. Gomes for a very interesting morning. I look forward to his talk at Sacred Heart Church next week. 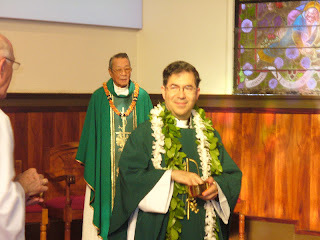 Mahalo to Fr. Vince Inghilterra for sharing the article below. 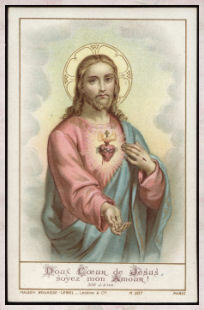 Every canonized Saint bears witness to an important fact: holiness is intimately connected with devotion to Mary, the Spouse of the Holy Ghost who is the Sanctifier. How could it be otherwise considering all graces come to us through the Mother of God and the Mother of the Church. 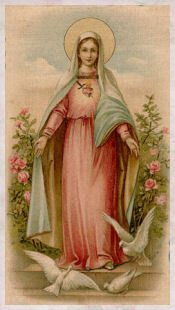 According to St. Louis Mary De Montfort in his classic Marian work, True Devotion to Mary, assaults by Satan will be most fierce and intense in the latter times. 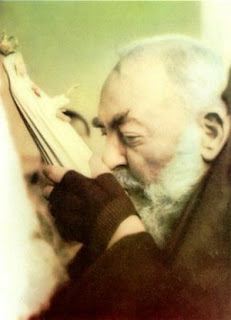 In speaking of the great saints and apostles of the latter times who will eventually triumph over Satan and his followers he gives what seems to be a pen sketch of Padre Pio, "They shall be true disciples of Jesus Christ, walking in the footsteps of His poverty, humility, and contempt of the world. . . . They shall carry on their shoulders the bloody standard of the cross, the crucifix in their right hand and the rosary in their left and the sacred names of Jesus and Mary in their hearts . . . " (these were the last words on the lips of the dying Padre Pio). 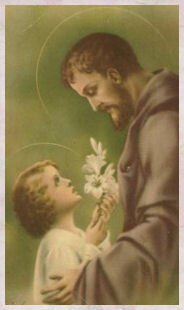 Padre Pio’s Marian devotion was a profound part of him from infancy to old age. He related later in life how as a boy he went to the shrine of Our Lady of the Rosary in Pompeii, near Naples, without permission, knowing that his mother would not give him the permission. He visited her shrine frequently when he was stationed in Naples as a soldier. Nothing could stand in his way when inspired to give Mary his love. The particular area of Italy where Padre Pio was born, Pietrelcina, had as a special patroness, Our Lady of Liberty. However, his devotion to her was expressed more in action than in words. 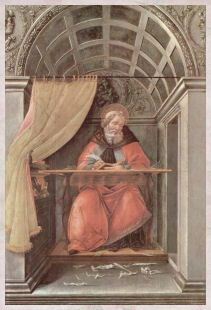 Though he wrote a brief meditation on her Immaculate Conception, and there are scattered references to her in his early letters (later on he was forbidden to write letters by the Holy See and as a result his written testimonies on Mary are few), yet, throughout his priestly life the most beautiful and effective "sermon" in her honor, was the Rosary which he prayed constantly. It was this chain of hope that linked him with heaven and the supernatural, that world which is unexplainable to the rationalist, and materialist. Similar to another great Franciscan Marian Saint of our times, St. Maximilian Kolbe, Our Lady appeared to Padre Pio as well. 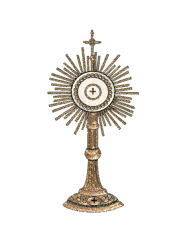 Upon being asked twenty years later why he had kept this and other supernatural visits a secret he replied in all sincerity that he thought everyone saw our Lady. 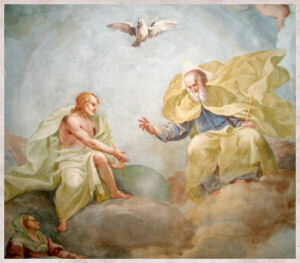 His spiritual director, Padre Agostino of San Marco, relates: "One day he ingenuously asked me ‘Don’t you see our Lady?’ At my negative reply he answered, ‘You are just saying that out of holy humility!’..." read the rest here. - Brother Francis Mary is a member of the Franciscan Friars of the Immaculate. He is the editor of numerous books under Saints and Shrines Series published by the Academy of the Immaculate. This article was taken from the recent book he edited entitled: Padre Pio- The Wonder Worker. The above article is taken from Padre Pio- The Wonder Worker edited by Brother Francis Mary, FI and published by The Academy of the Immaculate. You will also learn a brief history about the valiant dedication of the first Catholic missionaries in Hawaii who, like Father Damien belonged to the Congregation of the Sacred Hearts of Jesus and Mary. Their untold sacrifices, sufferings and triumphs served as the cornerstone of what we know today as the Catholic Diocese of Honolulu. For those who helped in this video project, a very special mahalo go to: Father Herman Gomes, SS.CC. who did an excellent job as the documentary’s “storyteller;” veteran broadcaster Jim Manke of Hawaii Public Radio for his inspiring voice as narrator; Father Stephen Van den Eynde , SS.CC., a retired Belgian Sacred Hearts priest for his Damien “voice;” and Sacred Hearts Provincial, the Very Reverend Chris Keahi, SS.CC. and Bishop Larry Silva for their unconditional support in helping make this video a reality. “THE STORY OF SAINT DAMIEN OF MOLOKAI, SACRED HEARTS PRIEST” was produced for the Father Damien/Mother Marianne Commission of the Diocese of Honolulu, by Venny and Jessica Villapando, 20-year veterans in Hawaii’s local television broadcast industry. Venny is also a member of the Father Damien/Mother Marianne Commission. Rest in Peace Father Raymond! It was deep sadness that I learned today that family friend Fr. Raymond Beach passed away. He had been one of my sister's really good friend and spiritual director for over 20 years. I am glad I had a chance to visit with him when I was in New Jersey a few months ago. My sister and I had a nice chat with Father as he recuperated from an accidental fall. A bittersweet thought I had when learning of Fr. Raymond's passing is that it was too bad that my brother in law was not able to have the family of boxer Jim Braddock (Cinderella Man)contact Fr. Raymond. He really would have liked that. Fr. Raymond had been the altar server at Jim Braddock's wedding. In my brother in law's defense, it was not for lack of trying. But I am sure Fr. Raymond and Jim Braddock will meet up in Heaven. He was a good and faithful priest. 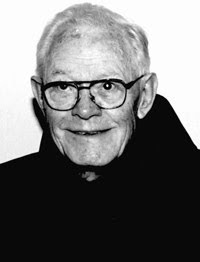 May Father Raymond rest in peace. 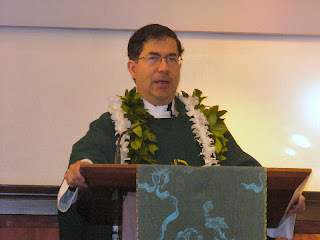 E Komo Mai Father Frank Pavone! Fr. Pavone during Holy Communion. Celebrant, Father Nagai is behind him. 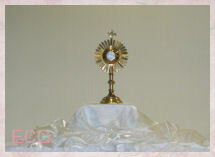 These photos were taken at the 7am Mass at Sacred Heart Church, Honolulu. Deacon Ronald Nelson of Hope Alive, is responsible for Father Pavone coming and speaking to the parishioners of Sacred Heart. 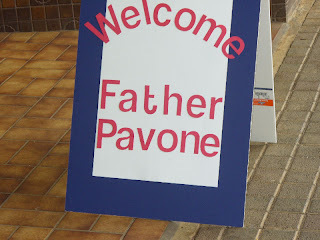 I found Father Pavone to be a very approachable and friendly priest. I introduced myself and he graciously went with me to meet my family. 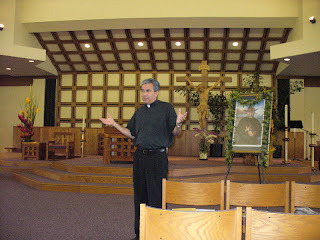 Father Pavone gave a strong homily on today's Gospel. He called us to care for one another. 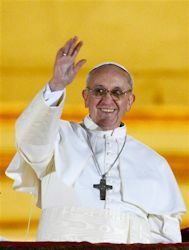 He emphasized the pro-life movement, Priests for Life in specific, not only cares about the unborn and defenseless baby, but also the mother and the father. He encouraged us to reach out to these women in need who may not be aware that help (financially, spiritually, emotionally, etc.) is available to women. 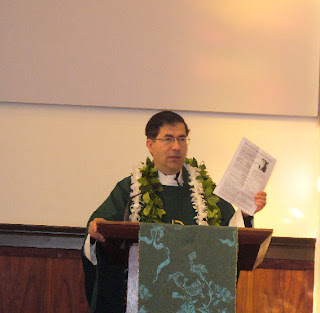 It is a real blessing that Father Pavone came to speak to all in Hawaii. He has a few more engagements coming up like a open-forum this afternoon at 1:30 pm at Sacred Heart Church and then a Hawaii Right to Life fundraiser dinner and talk at the Hale Koa this evening. 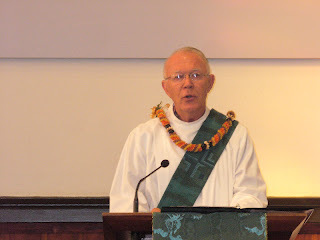 Father is also the guest speaker at the 40 Days for Life Honolulu on Tuesday. Please try to attend these upcoming events and bring your friends and family.